Activities which cover combined addition and subtraction facts, for students developing familiarization with these facts. Revision of the strategy of “Count on 1, 2 & 3”, using ten frames and number line for subitizing answers. Includes turnaround facts and missing number questions. 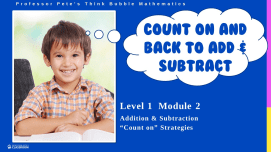 Revision of the strategy of “Count back 1, 2 & 3”, using ten frames and number line for subitizing answers. Includes turnaround facts and missing number questions. Revision of the strategy of “Difference of 1, 2 & 3”, using ten frames and number line for subitizing answers. Includes turnaround facts and missing number questions. Revision of the Rainbow strategy, using a ten frame for subitizing answers. Includes turnaround facts and missing number questions. Revision of the strategy of “Doubling” or “Halving”, using ten frames and number line for subitizing answers. Includes turnaround facts and missing number questions. Revision of the strategy related to “Doubles +1”, using ten frames and number line for subitizing answers. Includes turnaround facts and missing number questions. Revision of the “Near 10” strategies for +9 and +8 facts, using ten frames and number line for subitizing answers. Includes turnaround facts and missing number questions. Revision of the remaining facts 7+4 and 7+5, using ten frames and number line for subitizing answers. Includes turnaround facts and missing number questions. Revision of all addition and subtraction facts to 20. Includes turnarounds and missing numbers. More revision of all addition and subtraction facts to 20. Includes turnarounds and missing numbers. Set of 5 assessment tests to check on how students are progressing with each of the units in the Introductory Addition & Subtraction Facts series of worksheets. 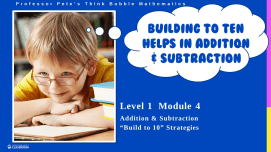 Set of 10 homework sheets to match each of the sets in the Introductory Addition & Subtraction Facts series. Contains information for parents.